The "Sins of the Saviors" SoundPack gives you the complete audio solution when playing the "Sins of the Saviors" Adventure. All the preparation is done for you, and every sound you'll need is right at your fingertips. After defeating the giants of Mokmurian, the heroes discover that Karzoug, an ancient wizard from the long-dead empire of Thassilon, has returned to life. From his city fortress of Xin-Shalast high in the mountains, he has been using the giants to harvest souls to reclaim his lost power. Will the PCs be able to discover the secret to defeating him before he can reclaim his realm? This SoundSet was imagined, compiled, designed, created, mixed, and finished by Benjamin Loomes of syrinscape.com, using samples created by him and also samples from the collaborative Internet database of creative-commons licensed sounds freesound.org. 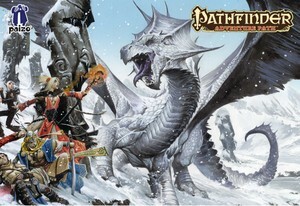 Pathfinder Adventure Path: Rise of the Runelords Anniversary Edition, Sins of the Saviors © 2012. Paizo Inc., the Paizo golem logo, Pathfinder, and Pathfinder Adventure Path are trademarks of Paizo Inc. Author: Stephen s. Greer. SoundSet © 2015. Sounds created under license with Paizo Inc.